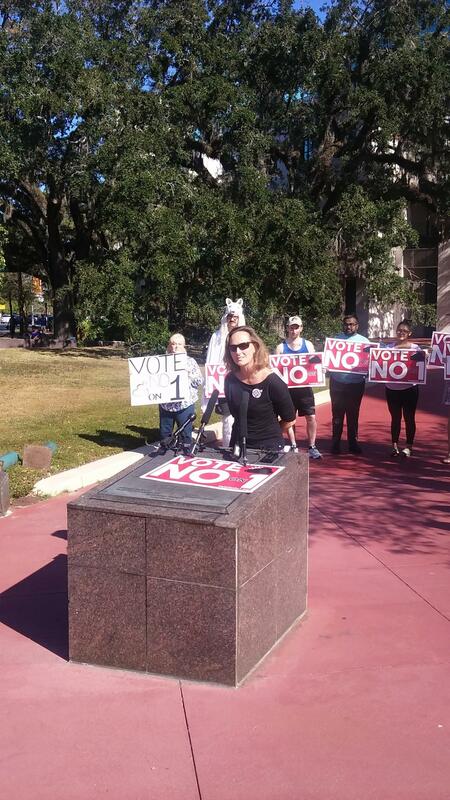 Florida Conservation Voters executive director Aliki Moncrief urges defeat of Amendment 1 during a protest Thursday at the Leon County Courthouse. About a dozen protestors, one dressed as a wolf in sheep’s clothing, stood in a hot Tallahassee sun near the courthouse entrance. League of Conservation Voters activist Aliki Moncrief admitted it was a sharp contrast to the $20 million-dollar pro Amendment 1 campaign put up by the state’s largest utility companies. The costume was an obvious reference to Florida Supreme Court Justice Barbara Pariente’s minority opinion accusing framers of pulling the wool over voters’ eyes. Backers trumpet Amendment 1’s constitutional guarantee to use solar energy, but downplay a “subsidy” provision that could lead to higher rates. Amendment 1’s stratospheric poll numbers began to plunge when a conservative strategist was caught describing the campaign as “political jiu-jitsu.” Opponents are asking justices to reconsider ballot approval, and Moncrief says opponents are feeling a wind at their backs. Amendment 1 needs 60 percent to cross the finish line, and the latest St. Leo University poll showed it hovering at 59.